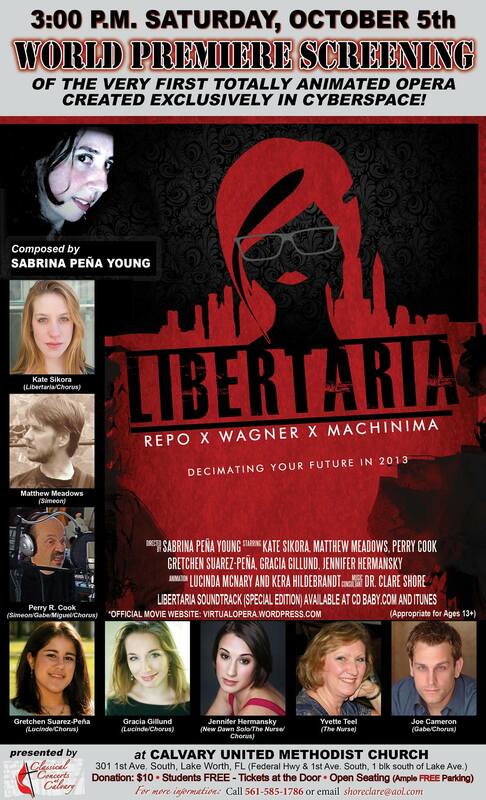 Poster art for the world premiere of Liberteria. what a great cast and amazing creativity, storyline and execution. Peña Young, a bubbly, intensely energetic native of South Florida, has created an animated “virtual opera” called Libertaria, a self-scripted sci-fi dystopia she cast entirely online, finding her singers through websites, Facebook and other Internet forums and having them send in vocal recordings of their parts. She’s never met most of the volunteer cast. In addition to playing the music herself on an electronic keyboard, Peña Young also created about 75 percent of the animation for her hourlong work. Libertaria is probably the very first machinima opera, and its world premiere screening is set for Saturday afternoon at Calvary United Methodist Church in Lake Worth. “It’s a way to bring opera to a wider audience, a younger audience, and then also a way to bring it online,” she said. Libertaria is set in a post-apocalyptic United States in 2139, which has been devastated by a nuclear war that has ruined the environment and transformed the polity into warring factions. A castoff girl named Libertaria, abandoned in the Lady Liberty Souvenir Shop as an infant, has escaped the Factory (an evil place of test-tube human manufacture) and made her way to the territory of New Miami. There she meets Simeon, an underground guardian of children who are being victimized by the masters of the Factory, an alliance known as the Collective. The seeds are sown for rebellion, which Libertaria is soon to lead. Peña Young, who is currently finishing on a novel based on her script, said she could see something along these lines happening. what a beautiful day!!! thank you so much, sabrina!!! brilliant!! !